It's not that I'm in the mood to have a baby, I'm not. To be honest, I am REALLY looking forward to my youngest finally going to ALL day school in a few weeks. I'll miss my kids, but the thought of having LONG hours of freedom to get everything done is just so tempting! But these next two weeks we are focusing on baby showers! Many of my friends and a sister or two are expecting, and so we're celebrating the birth of some sweet little ones. This week we're looking at a baby boy shower. 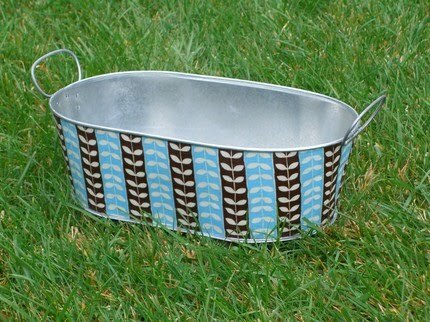 I absolutely LOVE the blue and brown trendy colors that are so hot right now. So as we plan this week's baby shower, I'm going to focus on those fun colors. 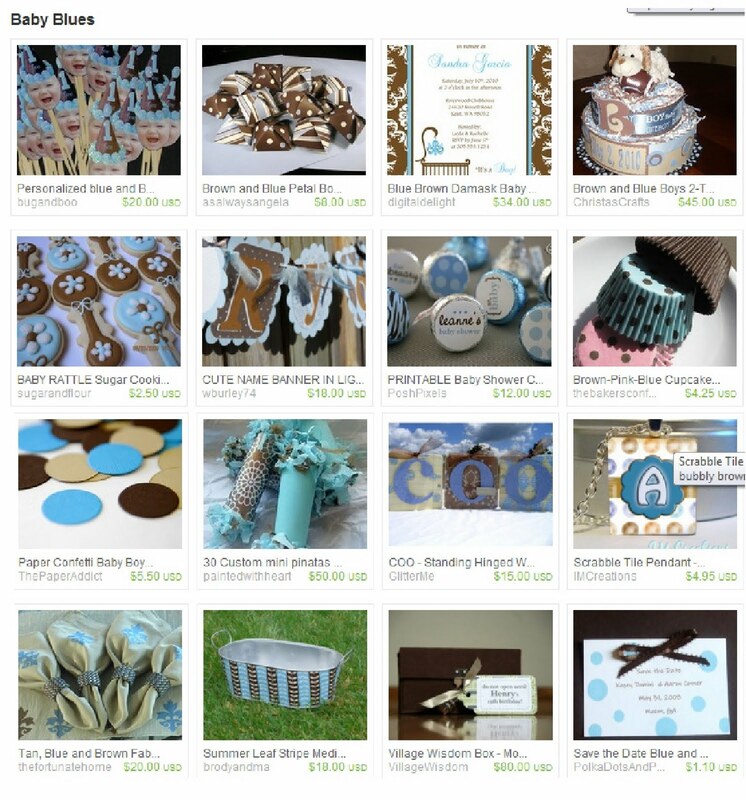 So LOOK at all these cute baby shower finds from some great ETSY sellers to help you throw an amazing blue and brown baby shower! This is such a cute invite. I'm a little more partial to the polk-dots, if you can't tell, but I love how the colors just draw you in, how simple this invite is, and how elegant it looks. 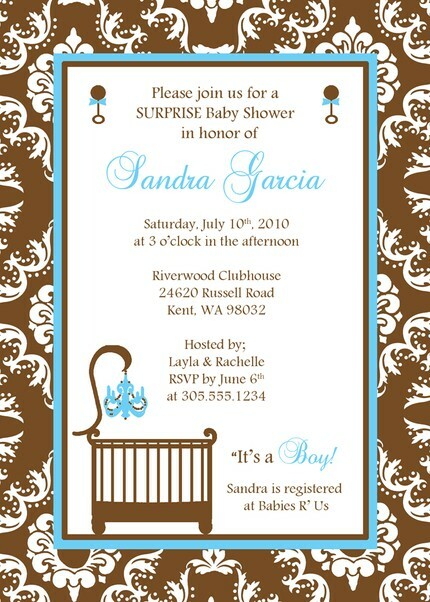 DegitalDelight did an amazing job with this brown blue damask baby shower invite! It would be great to send a PolkaDotsAndPaisley's Save the Date cards too so you can make sure everyone remembers to come to your party! Now that you've got your invites set, it's time to start the fun party....DECORATING. It's always my favorite thing to do! WBurley74 has an amazingly cute name banner where you can add the baby or mother's name to hang on the wall. Wouldn't that be so cute?! Or maybe you can just say "Baby Smith" or whatever for the family's name if you don't want to pressure the mom into announcing the permanent name now. 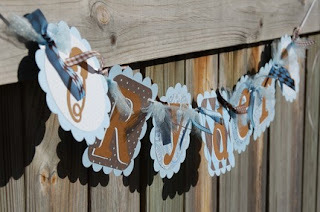 You can also use TheFortunateHome's blue and brown napkin rings, ThePaperAddict's confetti baby boy pieces, and ChristaCraft's diaper cake to decorate the tables. 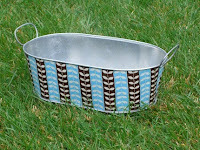 How about putting water bottles in this Striped Planter tub by BrodyAndMa's shop? Then, the mother-to-be can put the gifts she recieves in it when the party's over for an easy way to transport all of her adorable new clothes, socks, and blanket treats? Now it's on to the food. 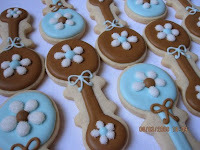 SugarAndFlour has the yummiest looking baby rattle's I've seen in a while. These would be a sweet addition to your table. Your guests may not want to eat them they look so good! If not, then they can eat cupcakes made with TheBakersConfections' Blue and brown cupcake liners and topped with BugABoo's personalized photo cupcake toppers. Aren't they amazing? 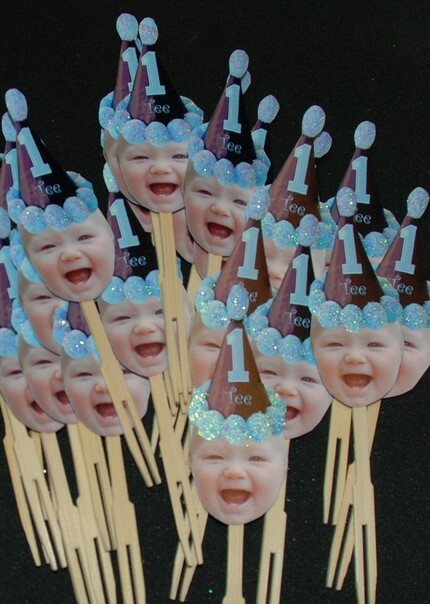 You obviously can't put the baby's picture on there, but the happy mom's would certainly be a fun way to celebrate her! You would certainly want to add some candy to the table with blue and brown M&Ms or PoshPixel's Hershey Kiss printable stickers! You can even put the M&Ms or Kisses in AsAlway'sAngela's petal boxes or PaintedWithAHeart's Mini Pinatas as a favor to take home. I LOVE this Village Wisdom Box by VillageWisdom! What is a village wisdom box? 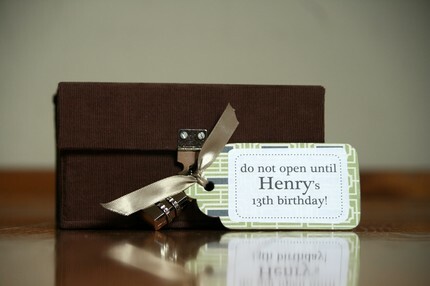 Here's what the description says, "We've created a special customized box with beautiful embossed note cards, customized instructions, birthday greetings, and a lock that opens with numbers corresponding your baby's 13th year." How awesome would it be to to have each guest write an memory of the pregnancy, advice for the child, or some sweet wish and lock it inside this box? The mother can be given the box and more cards so she can continue to write as the child gets older. Then the child can recieve it on his birthday years from now as a wonderful gift filled with love and thoughts about HIM. Who wouldn't just love that? 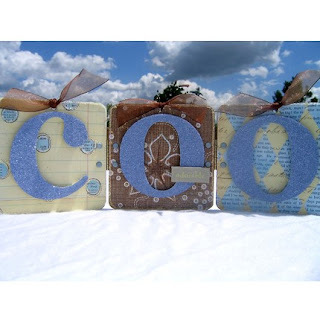 You would throw a baby shower the mother and child will remember for years to come! How great is that?